First time experience in assembling IKEA furniture. As some of you have seen on my Instagram pictures, I've finally got my work table! I was pretty excited about my table because I've been sitting on the floor for about few years now and it has really caused some back, neck and shoulder aches. 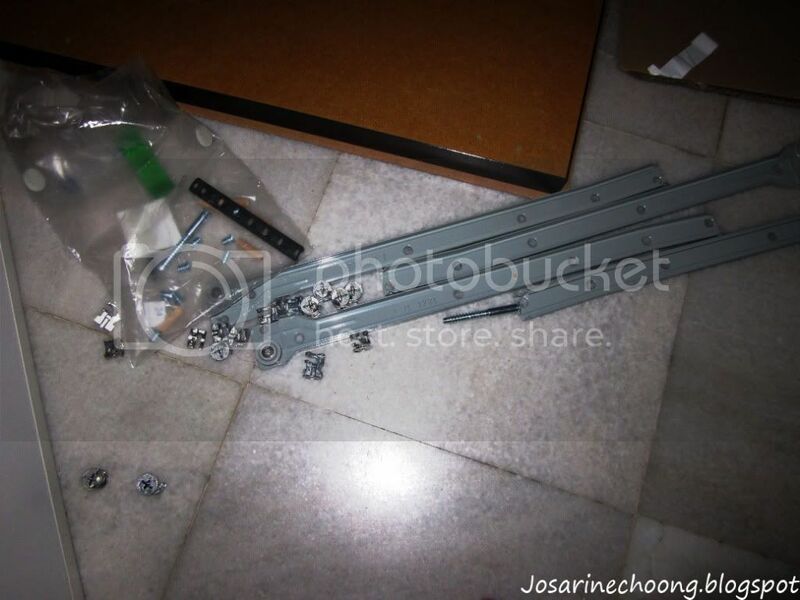 I forgot to take pictures of the parts before begin assembling because I did not think of blogging about till later on. :p But when I first opened the box my mind went *???? * literally. I even had second thoughts if I should do this, because what if i spoil it? But I decided to just take a look at the manual and see how it goes. The first page was the instruction for the drawers! You may check my Instagram for my drawers' picture. The first thought I had in mind was, "okay the drawer looks easy, just do this first, if it gets tough I'll stop". Actually it's really not too bad! The instructions are pretty clear, however you have to really look at the pictures properly. I'm kind of amazed at how detailed their instructions are including the drawing. They literally drew exactly how the furniture would look like. The other side of the leg. After assembling the parts, i brought them to my room because I knew if i assembled the whole thing at my living room I wont be able to carry it into my room. Wah, cool. How much you bought for this one? We have the same Ikea table lol. Thanks a lot for sharing such a easiest and thrifty way to assemble the furniture. Is this only for wooden stuff..?